I must have been pretty busy this week to miss commenting on "Lucy's baby," the most important find relevant to human origins in quite a few years. I always talk about this stuff in connection with HIST 2055, Ancient Civilizations. If this announcement had been made this time last year, it would have been quite a treat to bring it into the classroom. The find is an almost complete 3-year-old girl child who lived in what's now Ethiopia about 3.3 million years ago, and then was killed and buried by a flash flood in the desert. This flood led to the fossilization of nearly all her bones, producing a very unusual situation for paleontologists: they can actually see the just about the whole structure, not just extrapolate what it might have been. 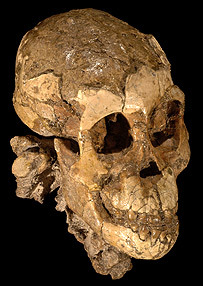 The girl is being called "Lucy's baby" because the previously most complete human ancestor of the same early species, Australopithecus afarensis, discovered in 1974, was called Lucy by her discoverer. Since Lucy was an adult and the two individuals are of the same species, it clearly felt natural to designate the girl this way, even though she lived many thousand years before Lucy. I will leave interested readers to look for more details and read on the significance of this find -- it's all out there -- but I will raise an interesting point from the BBC account. Paleontologists found the fossils back in 2000 and have been chipping them out of sandstone ever since. This gives you some idea of how difficult and painstaking is the work of the paleontologist. Working as I do in a university, I can't help thinking about their funding problems.